Updated Thursday February 28, 2019 by RYBA. Click LOGIN in upper right corner, you must create an account to register!! Please note: in order to qualify for the discount you must register all kids before checking out and making payment. 1. All families will be required to create an account the first time logging into our system. Please add all family members, players and parents by choosing the add children or add adult options (alternate contact information such as phone numbers and emails can be added when another adult is added to the account). 2. After the account is created this registration system will be used to register and make payments for any of the available programs. Through the registration system you will have access to all account information. 3. RYBA Online accepts Visa/MasterCard. NO REFUNDS WILL BE ISSUED! If you wish to pay by Check or Cash please visit Mullen Team Sports, Feltners or Sportscene. $15 additional fee for not paying online. 4. If you have multiple players, please register them all at the same time. To do this after completing one registration click the continue shopping button to register another player. If you would like to COACH please register yourself in the same manner. 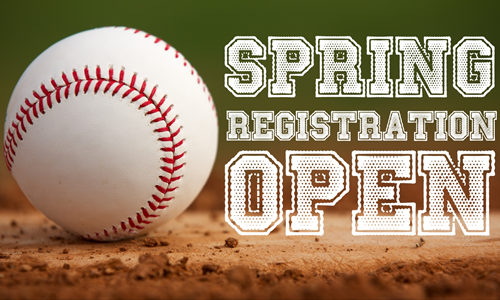 REGISTRATION FOR SPRING BASEBALL OPENS JAN 15th!! If you would like to be a coach or an assistant coach and you sign up online please make sure and register yourself as well as your child for the appropriate age division. Please feel free to make notes in the comment section if you plan to coach with another parent. No later than (NLT) Wednesday, February 27th the RYBA Board of Director’s will conduct manager (head coach) selection. Selected managers for each age group will be contacted by phone NLT February 28th. Please make sure your contact information is updated online if you registered to coach. Assistant coaches (1 per team) will be selected by the head coach of each team. TImes and Date subject to change! Information will be updated as it changes! Each child will field ground balls and throw them to first base and will also get 2-3 pitches to swing at during tryouts. Please show up with your child a few minutes early to get in the line up and have them prepared for a fun experience. Players will be notified by their coach by Monday March 4th. The spring season will start approx April 1st and will end NLT June 23rd. Teams will play 2-3 games per week weather permitting.